On an mutton in the chute. With Rodeo on his mind. He learned to rope and ride. Now she hauls a 3-horse slant. It’s her Hilton up on wheels. Wears her boots instead of heels. Feeds and waters with the sun. And her vacations, entry fees. and prays during every ride. She always heeds the call. They’re a cut above them all. Moses’ mom saved him from the hand of Pharoah (Ex 2), sure it was by sending him down the river in a basket…but still. Timothy’s mother and grandmother were commended for their faith (2 Tim. 1). Mary doesn’t get a ton of press in the Gospels, but in Luke she is shown as treasuring all the things in heart that Jesus would do (Luke 2.51). 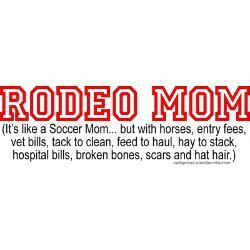 Rodeo Mom’s are cut from the same cloth. Mother’s poses a strength and courage that goes often unseen and uncelebrated. This weekend I saw Mom’s opening gates, stock contracting, loading and moving cattle, saddling horses, and still doing all the things that most Mom’s do on a daily basis, like feeding kids, enforcing nap times, and supporting their kids at something they love. It was then that I understood that Rodeo cant go on without Mom’s. They are some of the toughest people in rodeo. They witness their kids compete, coach them in their events, watch them fall down or buck off, see them struggle yet are fiercely loyal and supportive. Thanks to all the Mom’s of rodeo guys and girls who put you through torment and frustration and put extra responsibilities to an already overloaded plate. Thanks for driving all over the state, sacrificing normalcy 40 weekends of the year, and supporting your cowboys and cowgirls with all you can muster. Know that we love and appreciate you!